The best known of the insectivorous - insect-eating plants, is Venus flytrap also known as Dionaea Muscipula which exhibits a unique system by which it absorbs, attracts, kills and then it digests its prey. Being a plant it can make its own food through photosynthesis, while the Venus flytrap does not eat and digest its prey for the non-plant objectives of harvesting energy and carbon. As an alternate, it mines its victim primarily for essential nutrients like nitrogen and phosphorous; which are in short supply in its boggy, acidic habitat. This is the proof that the Venus flytrap does have a proper digestive system of sorts, but it serves a somewhat special purpose than any animals does. How does a stationary organism manage to attract its victim then kill and digest it? It lures its prey first with its sweet-smelling nectar, which is hidden on its steel-shaped leaves. Unwary of this, the prey lands on the leaf in search of a return. But by then the thick trigger hairs on the leaf awakenand they find themselves imprisoned behind the interlocking teeth of the leaf ends. There will be between three and six trigger hairs on the surface of every leaf. In case the same hair is touched twice or if two hairs are touched within less than 20-second interval, then the cells on the outer surface of the leaf will expand and the trap snaps shut immediately. However, if the insect secretion, such as uric acid, stimulates the trap, it will fasten down further on its victim and form a hermetic seal. Once the trap is closed, the digestive glands that line in the interior edge of the leaf secrete the fluids and dissolve the soft parts of the prey, then kill the bacteria and fungi, to break down the insect with enzymes; and then finally it extracts the essential nutrients. These nutrients are engrossed into the leaf, and in 5 to 12 days following the capture; the trap will again reopen to discharge the leftover exoskeleton. This process is followed for only three to five meals, as the trap will no longer capture the victims but it will spend more two to three months simply photosynthesizing before it drops off the whole plant. After around 10 unsuccessful trap closures, the leaf will stop to respond to touch and will serve up only as a photosynthetic organ. Where Do We Find These? You will find the Venus flytrap in a very limited range in sandy shrub-bogs. Venus flytraps are seen in coastal North and South Carolina, where it is listed as a scarce species. The ecological unit that supports Venus flytraps experiences common fires to clear out the competing plants and volatilize nitrogen in the soil. 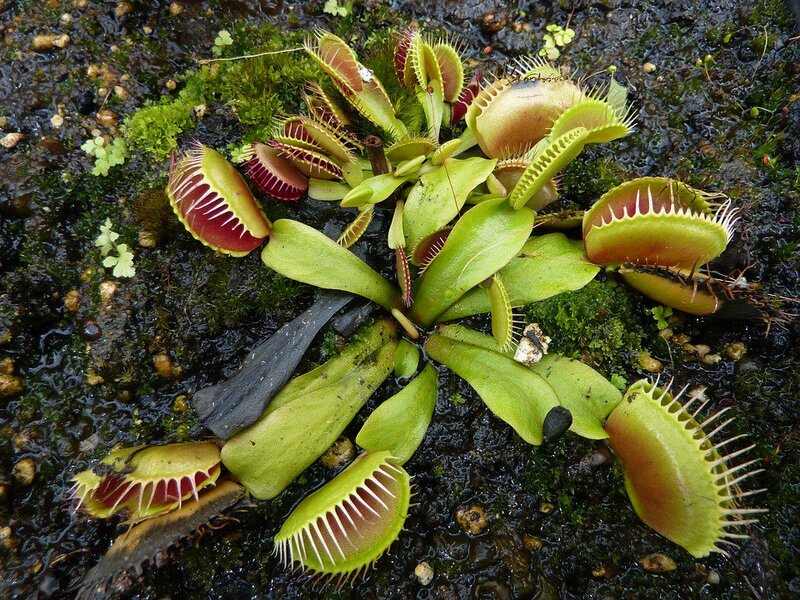 Hence, Venus flytraps have a bend on the nitrogen market instantly following thefire, when they get three-quarters of their nitrogen supply from insect prey. If the fire does not reoccur within ten years, however, competition with other plants restrict the Venus flytraps contact to light and insects, and populations start to decline. Venus flytraps give a fascinating example of how organisms acclimatize to stressful circumstances, in this case behaving as predators to make up for the nutrient deficiency in the surrounding soil.